Looking to have Painting Party? Art Station, in Brooklyn, is the place for you!!! Painting party for adults at the Art Station are a fun and different way to spend time with family, friends or loved ones. Looking to have an anniversary, birthday, or a company gathering? Any adult painting party are always a fun night to remember. The Art Station supplies everything you need for creating a painting– all you have to do is bring the beverage of your choice and join the painting party! 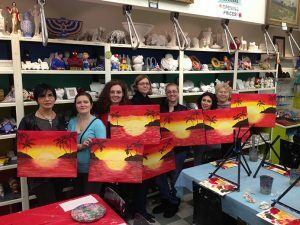 Our unique adult painting party, also known as "Paint 'n' Relax" is the perfect memorable night out to discover your inner talent. Surprise yourself with your very own work of art! Open to all adults, for all levels of experience or no experience at all! We highly encourage first-timers. Please call us to reserve your seat!! Price includes all materials: brushes, paint, easels, 16x20 canvas, palettes and aprons. The session includes step-by-step instruction by the artist from start to finish. You will learn about mixing colors and various brush and painting techniques. Want a private class with just your friends? Bring a group of 10 or more for any occasion! You will then be able to pick a day, time, and painting of your choice, for your own private painting party right here in Brooklyn, NY! Canvas Painting, Plaster Painting, Still Life Model Drawing / Painting (additional charge for model), Mosaic Creations, T-shirt Painting, Challah/Cheese Boards, Hand Paint Bags, Wine Glasses, or any other craft of choice.